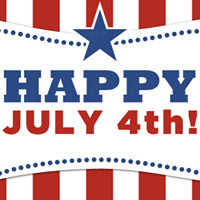 All TADL Network library locations will be closed on Thursday, July 4th, for Independence Day. This includes: Traverse City-Main, East Bay Branch and Kingsley Branch Libraries, Fife Lake Public Library, Peninsula Community Library, and Interlochen Public Library. All libraries will resume normal hours of operation on Friday, July 5.